In this post I will describe the changes to Search Web Parts in-depth. 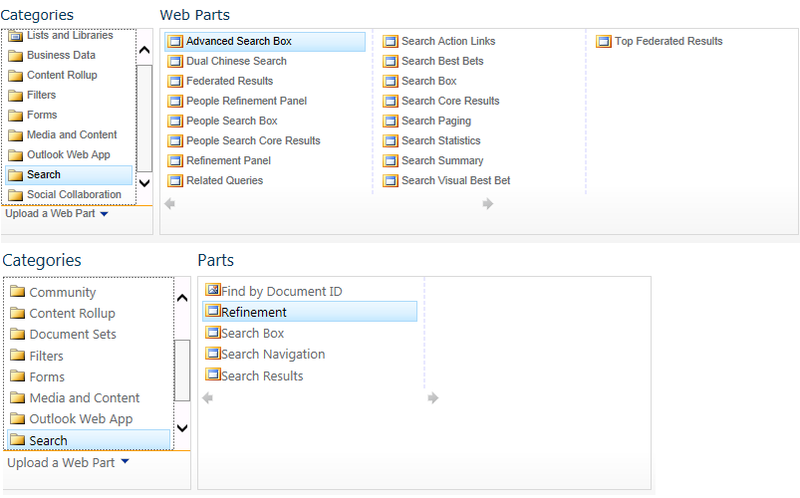 These Web Parts were changed as part of the new search platform which is available in SharePoint 2013. First thing you’ll notice when using SharePoint 2013 is the number of search Web Parts available. When you want to add a search Web Part you see that the number of Web Parts has been reduced drastically. When you look to this list at the first time it looks like a lot of search functionality is missing in SharePoint 2013. But that’s not right as we will see later. The best way how to show that is on the results page in a OOTB Search Center and let’s see the difference in number Web Parts in edit mode. The search results page in a search center in SharePoint 2010 contains a lot of Web Parts to display all information. 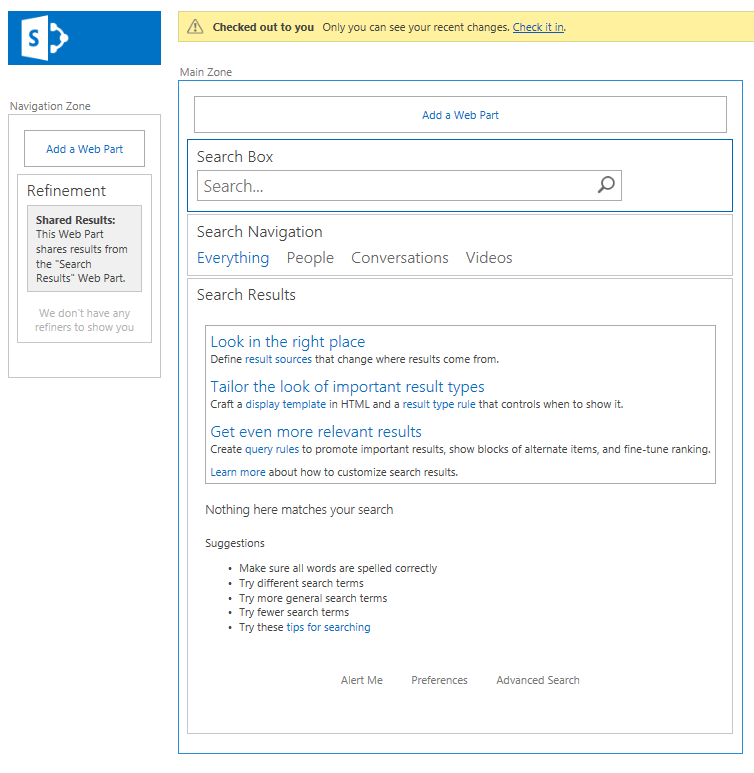 The Search Results Page in SharePoint 2013 contains only a few Web Parts. There is a simple clarification for this enormous reduction of a number of Search Web Parts and that is integration. The new Search Result Web Part is now containing the functionality of a lot of other Web Parts like the Search Paging, Search Statistics, People Search Results, etc. This is a major advantage when maintaining and configuring search Web Parts. Another major change is the way how the Web Parts are configured. In 2010 and before XSLT was the way to go when changing the search results being displayed. In 2013 this has been removed and you need to use Display Templates. Those Display Templates can be coupled to Result Types. Based on the type of search results you can customize the way search results are displayed. I will cover this more in-depth in part 3 of these series of articles. This implies that you need to change your customized search functionality in your solutions if you’re using it and want to use customized search results. As probably already noticed Search Scopes are deprecated in SharePoint 2013. Deprecated means that no new scopes can be created and existing scopes are read-only (this is also blocked from API). This also has implications for the Search Web Parts. The new Search Web Parts don’t provide support for Search Scopes but only for result sources. For example, the scopes drop down functionality is no longer part of the Search Box Web Part. Another thing to mention is the Site Collection Upgrade. When using a standard Search Center without modifications there is nothing to be done. The Site Upgrade handles the transition automatically. In case you are using search Web Parts outside a Search Center the upgrade process does not replace the Web Parts! This will results is some glitches. First problem you’ll notice is the styling. The old Web Parts do not comply with the 2013 style sheets which results in big buttons and other similar ugly glitches. Make sure you have an upgrade strategy ready for this and mitigate this using custom feature upgrades or manual steps after the Site Upgrade! Replacing the Web Parts can only be done after Site Upgrade. The 2013 Search Web Parts won’t work when in 2010 mode! Another thing I’ve noticed is that when still using the old Web Parts in 2013 mode, is that the search scopes are not respected anymore. SharePoint uses in 2013 a different way of creating the search URL’s and these are not compatible with the old Web Parts. That results for example that an All Site scope search automatically results in a search on whole SharePoint. Again the only way to resolve this is by replacing the Web Parts. An approach there is to create new 2013 search pages in your solution in a subfolder and using a feature reactivation provision these on new sites and also update the search configuration as mentioned in Part 1 of the series. * The Advanced Search Web Part is missing in the Web Part gallery but it still part of SharePoint. It is still possible to use that Web Part, but you need to export it from a Search Center and import the .webpart file in your site to use it. This entry was posted in Migration, SharePoint and tagged Search, SharePoint 2010, SharePoint 2013, Web Parts on 2 May 2014 by captain007.